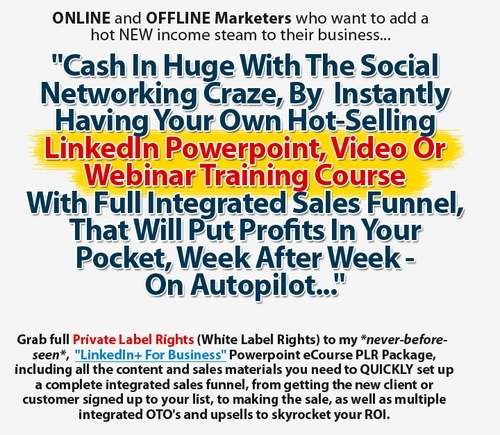 LinkedIn For Business PLR Sales Funnel: Plug in ONCE and profit for years to come on AUTOPILOT!!! 1. Do I need any technical knowledge to set this up myself? I tried to make it as easy as possible for you to set it up. I included a set up video and also included a comprensive step-by-step report showing you exactly who you can set this up. I also included a Quick Start video on the sales page and also an extra mindmap showing you how the sales funnel works. I went all the way to make it newbie friendly. If you are having difficulties with it, you can just contact my support and I will try to help you. 2. Do you have a Set Up Service to help us set up the sales funnel? Yes, if you can't set LinkedIn For Business Sales Funnel PLR up yourself, please contact me and I tell you more about our set up service that will do basic rebranding of the product and set it up for you on your domains. Everything will be done for you, including Squeezepage, Salespage, OTO, autoresponders etc. This is for serious people only as we charge for this service. 3. Your LinkedIn For Business PLR sales letter is so long, do you have a video that I can watch instead? Yes, I tried to make this offer as transparent as possible by showing you EXACTLY what you get so that you can be sure you need the product, before you order it. If the sales letter is too long for you to read watch the video below to see what you get and how to use it to implement this as an instant sales funnel of your own.